This one specific idea has had enough thought put into it that I think it deserves its own posting. Contents will be copied from my thread of half-baked ideas. Quote: An artificial world would take lots of work to build, and would basically allow you to put a habitable world in a system that did not originally have one. When building one, whatever player 'places' it should be able to set the planet's diameter (with limits), and would require use of a Genesis Device to populate the world with plants and animals. 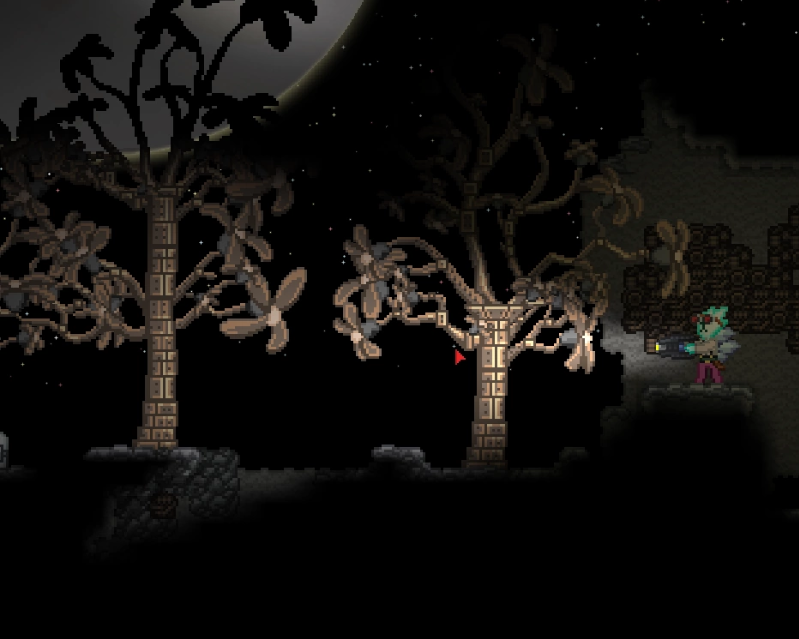 I like the idea of artificial planets, if only because the Frackin' Universe mod for Starbound had such cool-looking ones called Cyberspheres, with their own unique set of mechanical monsters and foliage. The whole thing was entirely metal, all the way down to the core, and is a great source of denser and rarer materials. Could be a fun new planet type for Hazeron, to add a little more variety. Your suggestion is more about making your own planets, though, which is horribly unbalanced. Especially if they generate infinite materials like any other planet. And they'd be triple-unbalanced if you didn't have to consume an entire planet of equal size to create one. And that would create so many problems and take so much work, and it just doesn't fit with the rest of the game's mechanics at all. I personally don't see how making your own planet is horribly unbalanced with the way I presented it, though it would need tweaks. - You can't get stone, ore, oil, etc. from one a player makes. Or, if you can, it will slowly deteriorate the health of the planet, until it is destroyed, or maybe permanently decreasing the Q of the planet. Potentially from a server-generated one, but I really don't think you should be able to do it at all. - Q of logs, plant fibre, food, etc. is dependent on the Q of the planet. So if you build your planet with, say, Q20 metal/stone/whatever, you're gonna get garbage lumber, garbage food, and garbage textiles. - There is a hard limit on how many can be created in each system - one. This could also be changed to a limit per sector if one per system is too unbalanced (which I now agree might be the case). - It could function as an alternative to a ringworld when the server generates a system. They could be hollow, with perhaps a large hole in one side of the planet, and would contain a stargate inside. Basically adding more variety to what ancient structures you can find while exploring. - Ultimately, a player-made artificial planet is worse than an average habitable world in a few ways. With the inability to get non-renewable resources, many materials can't actually be harvested from the artificial planet, like computer chips, plastic, metal, etc. They are only really good as a source of population, food, and renewable resources, in addition to being able to make a more fortified outpost in lucrative systems that are lacking decent planets. Player-made planets could also potentially contain stargates, but until a better tech system than patents comes along, that would be overpowered, yes. All in all, either as a player-made construct, an alternative to ringworlds, or both, Artificial planets would be cool and exciting addition to Shores of Hazeron. why not dyson spheres alltogether? So, if it's WORSE, and has no resources, why would I create it in the first place? (02-07-2019, 05:53 PM)AnrDaemon Wrote: So, if it's WORSE, and has no resources, why would I create it in the first place? I'll say it again, I guess. Quote: Q of logs, plant fibre, food, etc. is dependent on the Q of the planet. So if you build your planet with, say, Q20 metal/stone/whatever, you're gonna get garbage lumber, garbage food, and garbage textiles. Quote: good as a source of population, food, and renewable resources, in addition to being able to make a more fortified outpost in lucrative systems that are lacking decent planets. It doesn't have no resources. In fact, if you're able to build one at Q255, it's a source of Q255 Textiles, Logs, Animal Carcasses, Leather, Fish, Crops, Milk, Eggs... any renewable resource. Even then, say you could get resources like stone, ore, oil, etc. You'd literally just be taking the exact materials you put into it, which, after a time, would likely damage the structure of the planet. As well, it would allow you to have a habitable world in a system that otherwise would not have one. I recall there was someone who had searched through an entire galaxy looking for a Black Hole with a habitable world. This would solve that problem. If the planets are hollow, stargate or not, the interior would also be a great place to hide small fleets of starships, ready to defend the system. Also, because they'd look cool. These aren't meant to be something to solve all of an Empire's problems in one move. Are you saying you'd rather Artificial Planets be an overpowered, unbalanced mess that gives an empire everything it could ever need? They're supposed to be a fun late-game option to expand what players can do. (02-07-2019, 07:05 PM)StreetCaptain Wrote: It doesn't have no resources. In fact, if you're able to build one at Q255, it's a source of Q255 Textiles, Logs, Animal Carcasses, Leather, Fish, Crops, Milk, Eggs... any renewable resource. Sorry, I missed that part. Now, this sounds interesting. if haxus lets us build citys on ships you could make artificial "moons"
If we are just talking about a world with an artificial biosphere, then I think a small orbital habitat, for example the O'Neill Cylinder, would make more sense than a full an actual planet.